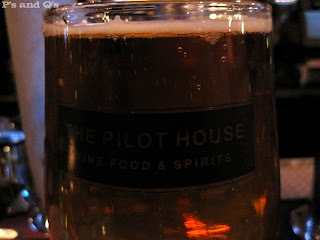 I've eaten at the Pilot House several times in the past. As far as I can remember, the food's always been good. My usual favourite is the prime rib sandwich with boursin cheese. Tonight, I had a pulled-pork sandwich, which was very good. Sandwich and a beer came to just under $25, including tip. A bit steep, but the ambience (for one, the subtle "Habs" decor, since Doug Harvey's son owns it), food, and drinks were all good, really. Now that the food part is "out of the way", on to the beer. I met fellow BeerAdvocate Chris there last night for some eats and a test of the beers. He was over for some work, and the next day looked like it was going to be a day off of sorts for me (and it was), so the trip to town was a no-brainer, really. We had an assumption that The Pilot House may not do the whole brewing process on site; that they may get their wort from some other place, and then take it from there. We asked our friendly server (who I know I used to work with at a Rodd's... I'm sure of it... just can't recall his name), who informed us that the basement was like "a mad scientist's lab", and that, indeed, they did brew their two varieties from start to finish. Chris asked for a couple of samples, and our server obliged, giving us each one of each. The Pilot Red, which I have had before, was, in a word, "meh". It was over-carbonated, had a somewhat similar smell to the pale ale, I think, and, really, no distinct flavour. Nothing to write home or online about. The Pale Ale (pictured), however, was better. I would almost describe it as 10-20% of an IPA. It had a nice, subtle, fruity / hoppy smell. The body was decent - medium - and the carbonation was fine. The flavour of it could have used a little more interest, but at the least the smell stayed strong throughout the glass. My advice to The Pilot House? Brew more memorable beers. Rotate them, and make them bold. Perhaps develop a strong, hoppy IPA, and rotate the other beer with interesting experiments... make it an every-two-months thing, perhaps. Get known for it, because you won't get as much of an impact in terms of recognition for what you have now. Cool... I checked the Orval myself last weekend, and saw it was around $4.50. I was like... well, I won't tell you what I thought, as I thought I told you it was around $3.50 and had directed you to buy more expensive beer. Either way, I should get one again and re-test it... take an "official" pic. Our "snow luck" seems to have ended that week, though. Weekend and mid-evening storms just aren't doing it! i have it on good authority that The Pilot House does not in fact brew from scratch. i do however envy the set up they own. island made it is!